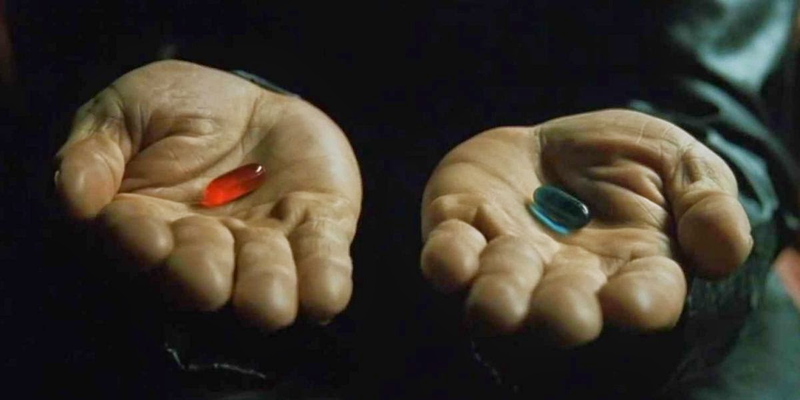 You take the blue pill—the story ends, you wake up in your bed and believe whatever you want to believe. You take the red pill—you stay in Wonderland, and I show you how deep the rabbit hole goes. Remember: all I'm offering is the truth, nothing more. Have We not shown man the two ways? But he has not attempted the way of ascent..
Verily, We showed man the way, whether he be grateful or ungrateful - the choice is his. Sufism and Islam, if one would like a simple path, are extremely simple. Just respond to whatever you think, feel, and perceive (including your sense of self) at each moment with the intention of being unconditionally grateful, over and over (and if one believes in God, being unconditionally grateful to Allah, who encompasses and pervades anything in one's consciousness). Not only will this increase the likelihood of tranquility and love filling one, but it will also increase the likelihood of making wiser decisions in one's life. There are, however, numerous Sufi and Islamic practices, doctrines, and institutions that can facilitate cultivating the attitude noted above. If one wishes to make use of these practices and doctrines, they can make one's Sufism and/or Islam more complicated. But often people feel that they need such practices, doctrines, and institutions, and so Sufism and Islam provides them. In addition, another complicating factor is that most people have a whole slew of conditions and questions that they feel a need to pursue, conditions and questions the pursuit of which causes them at various times to abandon making the intention to be unconditionally grateful at each moment, which I noted at the outset. May we all become conscious of the merciful ocean of God's infinite and all-encompassing blessings and peace. Just respond to whatever you think, feel, and perceive (including your sense of self) at each moment with the intention of being unconditionally grateful, over and over. In essence he is providing us the very haqiqat of the transformation and disposition that is expected when every Muslim again and again when he she utters and repeatedly utter the word "Alhamdulillah", sometime inwardly (silently) and other time in vocalization at the beginning of their salat, their prescribed connection and renewal of bond with the Beloved and link for blessings (salawatun). When we have a disconnect between the words of our prayer and ourselves, then we often miss the transformative power of those words. Alhamdulillah is one such word which a Muslim says again and again and yet because of that disconnect we miss the opportunity to practice what we are called to practice, which is unconditional gratitude. When we practice becoming unconditionally grateful in every thought, every feeling, every action, every perception - then we have indeed arrived an important station in the Way. This practice can not be a disconnected, discreet one but has to be continuous. Like Therese of Lisieux (1873 - 1897) who practiced the "little way," as she called it and believing that "trifles" or small things please God. She put all of her effort and love into doing the most simple chores of her monastic life, like washing dishes, cooking, cleaning toilets. When we do, then the awe of the everyday is always here waiting for us to notice. As we begin to notice the small things with unconditional gratefulness in our heart and mind, and if we allow ourselves to relax enough, we can begin feel a sense of connection with everything. And lest we forget, Allah is Encompassing everything. As we settle into this we may notice how nourishing this connection is. One way to practice is to express this nourishment as gratefulness--this nourishment is not just for us, but by expressing gratefulness, we share it with others. In a book by Regina Sara Ryan, the author writes about gratitude: "Another reason we turn logical with our gratitude is that it is terrifying. The wonder of a moment in which there is nothing but an upwelling of simple happiness is utterly awesome. Gratitude is so close to the bone of life, pure and true, that it instantly stops the rational mind, and all its planning and plotting. That kind of letting go is fiercely threatening. I mean, where might such gratitude end?" According to Islamic Cosmology, Shukr or gratefulness has no end. Even towards the finality of history as we are transmitted, in the Kingdom of God, the praise and gratitude continues. Shukr, giving thanks, is a knowledge and an encouragement. It makes you aware of the source of life and it reminds you that He is the Answerer of prayers. Its first degree is thanks with the tongue, which is dhikr. (It is the hand at the beginning of every salat, the recitation of Alhamdulillah). Its second degree is thanks with the whole body, which is service to Allah both in the prescription and in assisting His creatures. The third degree is thinks with the heart, which is thanks in the Presence of Lordship, and recognition in the audience chamber. Shukr is the act due to the devotee, servant. According to us shukr should never be expressed unless it is preceded with hand. For hand, praise, belongs entire to Allah, it is His and the slave has no portion in it. Thus it is more fitting to present to Allah what has none of the slave in it before presenting what is entire from the slave. It there has been du’a, then the shukr follows His answering it. If there has been no supplication then He has given the servant even without asking. The dhikr of shukr therefore begins with hand in every case. On the subject of ‘gratitude’ (al-shukr), al-Qushayrī relates a remark by al-Shīblī that it consists of "seeing the Benefactor, not His beneficence". This definition coincides with that given by Ibn 'Arabī on shukr 'ilmī, ‘knowing gratitude’, which he distinguishes from that which is manifested in words or deeds (the French word ‘reconnaissance’ [i.e. gratefulness by recognition] would undoubtedly be the most appropriate translation of the Arabic expression). Contemplating meanings to be thankful is one. So which of the gifts of your Lord would you deny? So in gratitude remember the favors of Allah that you might succeed. What is the nature of being unconditionally grateful. What single attitude is central to Islamic Spirituality? Is it being unconditionally grateful for everything you can think, feel and perceive?